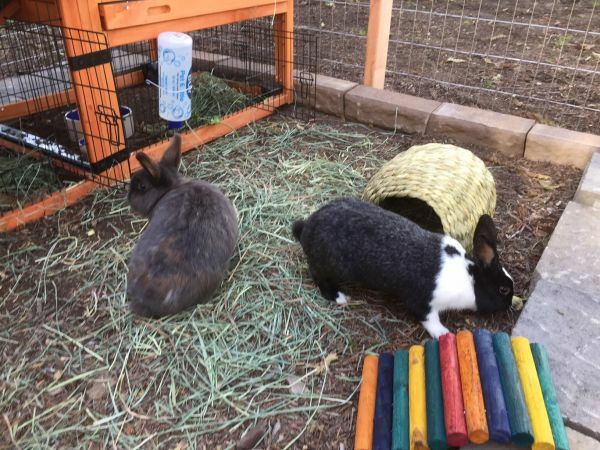 St Mike's is blessed to have two beautiful bunny companions named Lucy and Ethel. Playful and friendly, both of our ladies love to hideout in their play tube, snack on bunny treats, and receive their many fans at church functions like the End of the Year BBQ and St. Francis Day when they get to roam in the yard a bit. Below is a video of Miss Nibble's and her bonded mate, Albert who were the bunnies who started it all at St. Mike's. Unfortunately Albert's time with us was short, but he will be remembered fondly for the time he helped make Saint Mike's a friendly and warm place. Ms. Nibble's, on the other hand, was adopted into a lovely home and we still keep in touch with her from time to time.